Elegant French Art Deco period burled wood pedestal. 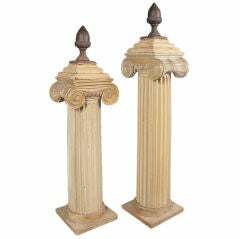 painted wood and plaster Ionic columns mounted with cast iron acorns. Elegant French Art Deco waknut and shagreen cabinet with black marble inlay and polished brass mounts, fitted with two cabinet doors, silverware drawers and drop front bar compartment. 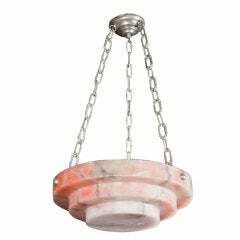 Art Deco period alabaster hanging light fitted with silver-plated bronze chain. Elegant cherrywood Art Deco cabinet in the manner of André Arbus, the doors featuring a veneered geometric design, the base fitted with gilt bronze mounts. France, circa 1940.